Your kneecap (patella) sits over the front of your knee joint. As you bend or straighten your knee, the underside of the patella glides over the bones that make up the knee. The kneecap is in an abnormal position (also called poor alignment of the patellofemoral joint). There is tightness or weakness of the muscles on the front and back of your thigh. You are doing too much activity that places extra stress on the kneecap (such as running, jumping or twisting, skiing, or playing soccer). The groove in the thighbone where the kneecap normally rests is too shallow. One common symptom is a grating or grinding feeling when the knee is flexed (when the ankle is brought closer to the back of the thigh). The health care provider will perform a physical exam. The knee may be tender and mildly swollen. Also, the kneecap may not be perfectly lined up with the thigh bone (femur). When you flex your knee, you may feel a grinding feeling below the kneecap. Pressing the kneecap when the knee is straightening out may be painful. Your provider may want you to do a single leg squat to look at muscle imbalance and your core stability. X-rays are very often normal. However, a special x-ray view of the kneecap may show signs of arthritis or tilting. MRI scans are rarely needed. Resting the knee for a short period of time and taking nonsteroidal anti-inflammatory drugs (NSAIDs) such as ibuprofen, naproxen, or aspirin may help relieve pain. Change the way you exercise. Learn exercises to both strengthen and stretch the quadriceps and hamstring muscles. Learn exercises to strengthen your core. Lose weight (if you are overweight). Use special shoe inserts and support devices (orthotics) if you have flat feet. Tape your knee to realign the kneecap. Wear the correct running or sports shoes. 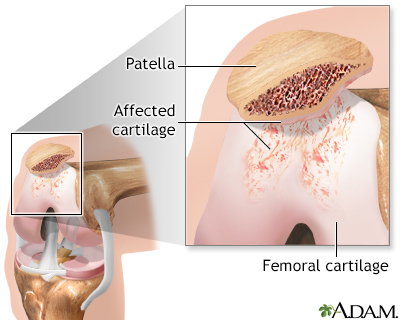 Kneecap cartilage that has been damaged may be removed. Changes may be made to the tendons to help the kneecap move more evenly. Kneecap may be realigned to allow for better joint movement. Anterior knee pain often improves with a change in activity, exercise therapy, and the use of NSAIDs. McCoy BW, Hussain WM, Griesser MJ, Parker RD. Patellofemoral pain. In: Miller MD, Thompson SR, eds. DeLee & Drez’s Orthopaedic Sports Medicine. 4th ed. Philadelphia, PA: Elsevier Saunders; 2015:chap 105. Tan EW, Cosgarea AJ. In: Miller MD, Thompson SR eds. Patellar instability. DeLee & Drez's Orthopaedic Sports Medicine. 4th ed. Philadelphia, PA: Elsevier Saunders; 2015:chap 104. 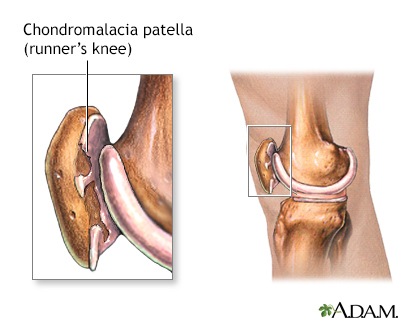 Chondromalacia of the patella is the grating or grinding sensation during extension of the knee. The cause is thought to be related to overuse, trauma and/or abnormal forces on the knee, such as a mildly abnormal alignment of the patella (knee cap) and femur. Symptoms include knee tenderness, pain in the knee after sitting for a prolonged period of time, knee pain that is worse with stairs or getting out of a chair, and a grating sensation in the knee. Chrondromalacia causes knee tenderness, knee pain in front of the knee, and a grating sensation in the knee. The knee pain is worst after sitting for a prolonged period of time or when getting out of a chair. The knee cartilage is affected probably from overuse, trauma and/or abnormal forces on the knee, such as a misaligned patella. Chondromalacia is treated with rest or immobilization and nonsteroidal anti-inflammatory drugs for pain. Physical therapy, especially quadriceps strengthening and hamstring stretching may also be helpful. Surgery is beneficial if there is a problem with the alignment of the patella that cannot be corrected with therapy.